Electronic Kit School. - Do you want to build by yourself onboard USB power outlet for charging or running portable USB appliance this time? We suggest you to use LM2596 IC to build this USB car charger do you needed. With this LM2596 IC, you can create a usb power outlet that has more efficiency which can cope with higher current requirements, so that it also becomes suitable for more powerful standard usb devices and non-standard usb decorations. 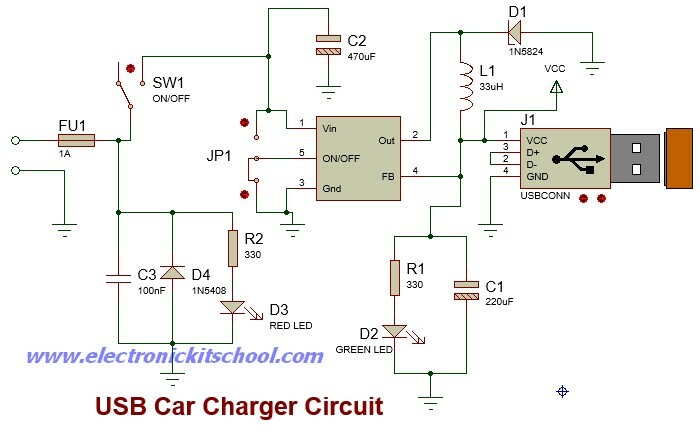 In this article we will show you one electronic circuit that will give you Simple USB Car Charger Circuit using LM2596 IC like in Figure 1 below. Beside that we will show you the component parts and the description of this circuit for you. 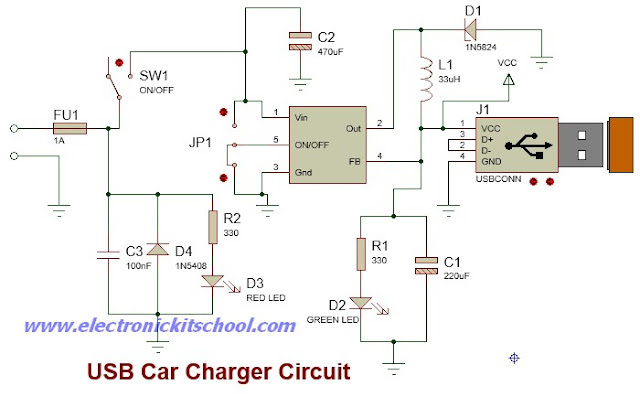 Circuit like in Figure 1 above show you about the Simple USB Car Charger Circuit using LM2596 IC. According Electroschematics site describe that according to the USB Battery Charging Specification, a device plugged into a USB port to charge may find itself connected to a source that is capable of data transfer as well as power, or it may be connected to a source that provides power only. If the source supports data, the device is expected to do a trickle charge only, but if the source does not support data, the device may draw more current because the source is likely to be an ac adapter. The DC voltage delivered by the car battery is routed to the input of the circuit through the indash cigar lighter power socket in a car. The fuse (FU1) and diode (D4) are wrong polarity/overcurrent circuit protection components and the capacitor (C3) is a smoothing element. When on/off switch (SW1) is turned to its on position, this input supply is extended to the rest of the circuit, and the power input indicator (RED LED) lights up. The switching regulator (buck converter) circuit is built around the LM2596 IC,and is mostly based on the design given in the device’s datasheet. The LM2596 IC series of regulators are precision monolithic integrated circuits that provide all the active functions for a step-down (buck) switching regulator, capable of driving a 3A load with excellent line and load regulation. These regulators operates at a switching frequency of 150 kHz thus allowing smaller sized filter components than what would be needed with lower frequency switching regulators. Here, the 5V fixed output version LM2596 is used as the switching regulator. Note that the output available is highly dependent on the quality of inductor (L1) and output capacitor (C1). For the inductor, the dc current and resistance ratings are critical in addition to its inductance. For the capacitor, a low ESR is essential. The green LED is the power output indicator. Stable 5V dc output from LM2596 is branched into two usb outputs, named DP (Decoration Port) and DCP (Dedicated Charging Port). DP port can be used to run non-standard usb gizmos like usb reading lamp, heater, fridge, etc.